In the mind of Saint Ignatius of Loyola, one of the most efficacious tools or means to draw closer to God, to live out Principle and Foundation, and to renounce the reality of sin and its consequences is the meditation upon what are called THE LAST THINGS. 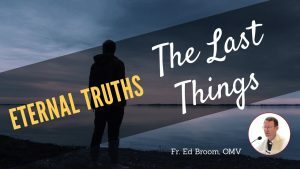 In the realm and study of theology this is called ESCHATOLOGY— the study of the Last Things. Therefore, this Lent let us set aside our time, our energy, and our good will to meditate upon the reality of the Last Things. The topics are very serious but very real and pertinent to the attaining of our eternal salvation—the living out of Principle and Foundation. WHAT ARE THE LAST THINGS??? The Last Things are the following: the reality of DEATH, after which follows JUDGMENT, which terminates in one’s eternal destiny: either HEAVEN or the reality of HELL. As Catholic believers, we also espouse the reality of PURGATORY—a temporary place of purification which eventually leads to heaven. There we have it: DEATH, JUDGMENT, HEAVEN, HELL, AND PURGATORY. ETERNITY. Permeating the whole reality of the Last Things: Death, Judgment, Heaven, Hell, and Purgatory is the sobering but all so true reality of ETERNITY—meaning: forever and ever and ever and ever without end!!! In this short essay, we will offer a Biblical passage and meditation on the reality of Death—explain the text and elicit various points and conclusions for our meditation and our deeper union with God. One of the primary purposes of the meditation upon the Last Things—Death, Judgment, Heaven, and Hell, as well as Purgatory, is to help us reflect upon the shortness of life, the serious character of living out Principle and Foundation, and the real danger of sin—falling into grave sin and the possibility of dying in grave sin. As well as the importance of meditating upon Heaven and longing to attain it with every fiber of our being. In this meditation on DEATH, the Biblical passage presented for our spiritual enrichment and growth will be a death that was not exemplary, a death that did not end on a good note, the death of a very famous man who did not obey God. The meditation will be on the death of the Leader of Israel, King Saul, who would be replaced by David as the new King of Israel. PURPOSE OF THIS MEDITATION. The primary purpose of this meditation directed at us is the following: begging for the grace of humility, obedience, and perseverance in a faith that is supported by good works pleasing to Almighty God. Furthermore, this meditation should motivate us with a strong awareness and desire to renounce sin and all its trappings, and all that leads us to sin. As well as a sincere desire in our prayer to be humble and to recognize that like King Saul, we can fall away and end our lives distant from our loving God and Father. In a word, we too can decide to abuse our freedom, rather than to use it to honor and praise God and save our souls! 1. WHAT IS DEATH? A short concise definition of death is: “The separation of the soul from the body.” This is the theological definition of death. 2. WHEN WILL WE DIE? A good proverb that I learned from an elderly and holy woman in Argentina says it all: “La muerte is lo mas cierto, pero es lo mas incierto.” Translation: “Death is the most certain, but it is also the most uncertain.” This proverb teaches us that we will all die one day, but we know neither the day nor the hour. 3. THE TWO WORST OF REALITIES! The two worst things that can befall us are committing a mortal sin, and worse yet, dying in the state of mortal sin. If we commit a mortal sin, there is always hope; we can always return to God through repentance and Confession. However, if we die in mortal sin then we lose our immortal soul for all eternity! 5. THE SAINTS AND THE REALITY OF DEATH. Many of the saints meditated on the reality of death. Actually, Saint Alphonsus Liguori wrote a book titled “Preparation for Death”. The saints insisted on living each day of our life as if it were the last day in our life. One day this will be a reality, but we do not know when, so we must be prepared! 7. PERSEVERANCE IN GRACE UNTIL THE END. As you meditate upon the fall of King Saul and his unhappy death, you should think seriously about your life right now and the possibility of falling out of grace. Then with all the fervor of your soul you should beg, through the intercession of the Blessed Virgin Mary, for the grace of final perseverance. As Saint Alphonsus teaches us: “The grace of all graces is to die in the state of grace.” That means the salvation of your soul! 9. HONOR, POWER, FAME, AND PLEASURE. King Saul was famous; he had power; he had luxury and pleasure. All of these can be obstacles in the life of a follower of Jesus Christ. Open your eyes and be aware of the many insidious tentacles that the devil can use to ensnare you! Stay awake and be vigilant! 10. DISCOURAGEMENT AND DESPAIR. Saint Faustina Kowalska in the Diary: Divine Mercy in My Soul states that the worst of all sins is that of failing to TRUST in God’s never-failing and all-powerful Mercy. The root cause of the fall of King Saul was both pride and a lack of trust in God’s love and mercy. The Psalmist teaches: “God is slow to anger and rich in mercy.” (Ps 145:8) Despite our weaknesses, limitations, and many failures we should never lose our trust in God! CLOSING PRAYER: Beg the Blessed Virgin Mary for the grace to be humble, to trust God, to return to God constantly after falling with a limitless trust in His Infinite Love and Mercy! Pray fervently the HAIL MARY and beg for the grace of all graces: a holy and happy death! Hail Mary, full of grace, the Lord is with thee. Blessed art thou among women, and blessed is the fruit of Thy womb, Jesus. Holy Mary, Mother of God, pray for us sinners, now and at the hour of our death. Amen!